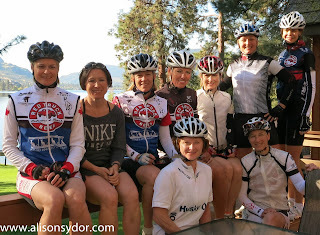 Finally I sit down to write a few words about this year’s Okanagan Women’s Cycling Camp. 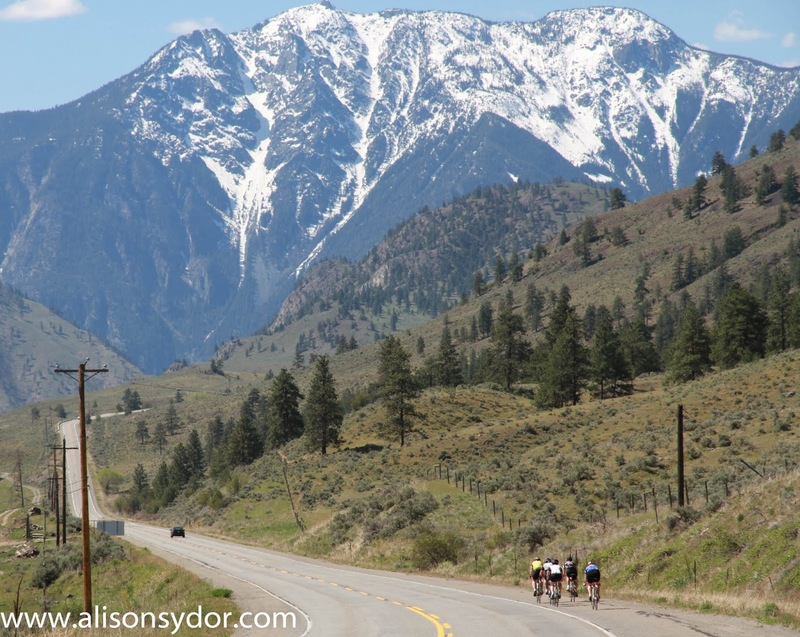 My how time flies – and I don’t just mean from my time getting home to now sitting down to write this – but as I sit here now I also inevitably reflect a bit on my many past cycling trips to the Okanagan. This was my sixth time in as many years to make a trip to the Okanagan in the first week of May for 4 days of cycling in the area. Even though this year we had perfect weather every day of the camp, being springtime I’ve experienced it all from 2 degrees and rain to 30 degrees and blazing sun – near hypothermia to near heat exhaustion! As unpredictable as the weather can be in May, the one constant has always been the wonderful feelings at the end of each camp – leaving with some mileage in the legs, having enjoyed good food, good rest and above all else the tremendous sense of enrichment having just shared the whole experience with a great group of women. My "Okanagan Springtime Women's Cycling Camp" took place from May 1-5, and was based out of the collection of cabins along the shores of lake Skaha known as the Ponderosa Point Resort. 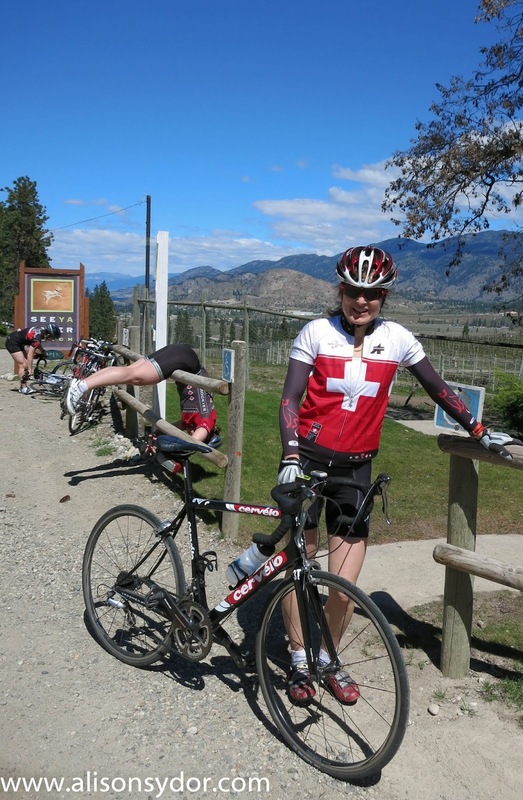 A former teammate of mine on the National Team and one of the camp coaches, Kelly Ann, first invited me to join her group for their annual spring cycling trip back in 2008. That was the first time I experienced this fantastic location for myself. I drove up very early on Wednesday morning from West Vancouver and what a pleasure to arrive at the lake under warm sunny skies. 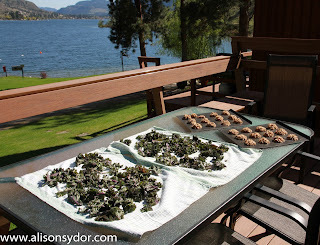 After unpacking all my gear, I fired up the oven, and laid out all my baking tools. One of the women coming to the camp who had carpooled up with me offered to join me in the kitchen for a mini bake-athon. 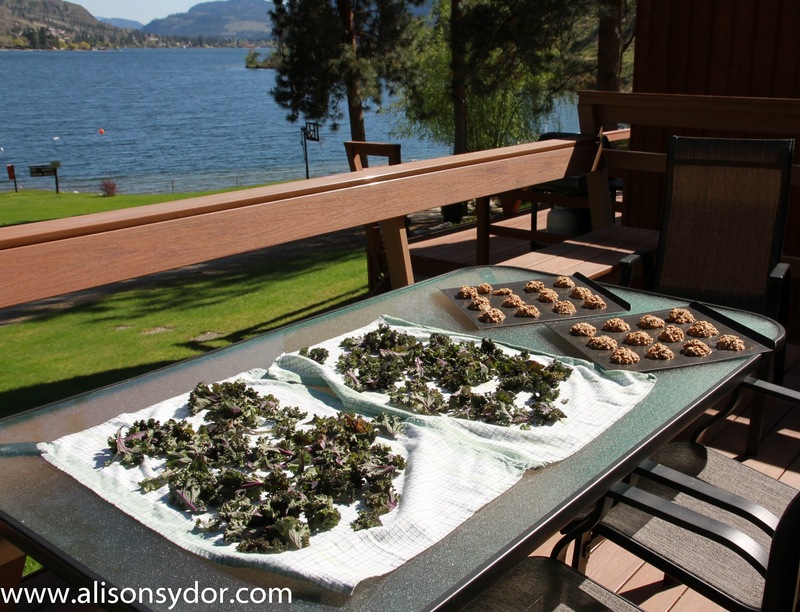 We had the sliding glass doors to the cabin open, the tunes on and in pretty short order had pumped out two types of cookies, kale chips, and fresh hummus for the week. We had time to relax with tea/coffee and enjoy some of our fresh baked goods before the others started to make their arrivals. Dinner was a casual affair with the arrivals and later arrivals all enjoying the fabulous Indian style buffet prepared for us by local chef Jordan Ash. We did some introductions and went over some of the routes for the week, but generally the evening was for all of us about relaxing and getting to know a bit about the women we were about to share the next four days with. I woke up early Thursday, opened one eye and saw blue, turned over and smelled coffee (thanks Kelly Ann) and hopped right out of bed. Though I’m not really a morning person I was sharing a room with my sister who is even less so, and with all things being relative I was feeling like quite the morning glory. I delivered her a coffee in bed, shut the door, grabbed my own and went outside on the deck to enjoy the beautiful lakeside scene before me. We started the camp with a shorter ride on day one keeping in mind there were a couple much longer rides yet to come. Best in my experience to ease into the riding even when one is rearing to go. 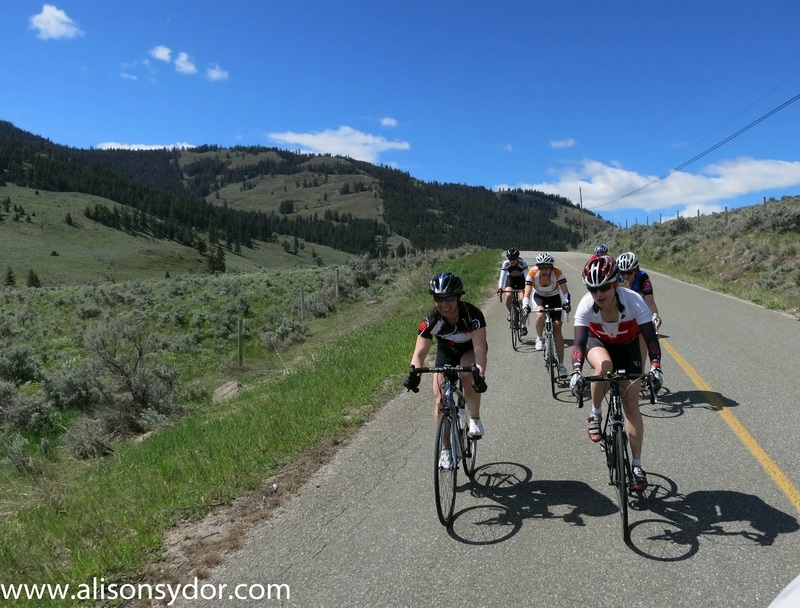 We'd all had a long travel day the day before, and for some of the Alberta riders this would already be their longest ride outside of their spring season. The out and back route along the bench road to Naramata is a lovely ride to take in the local scenery and warm up the legs with some small hills. 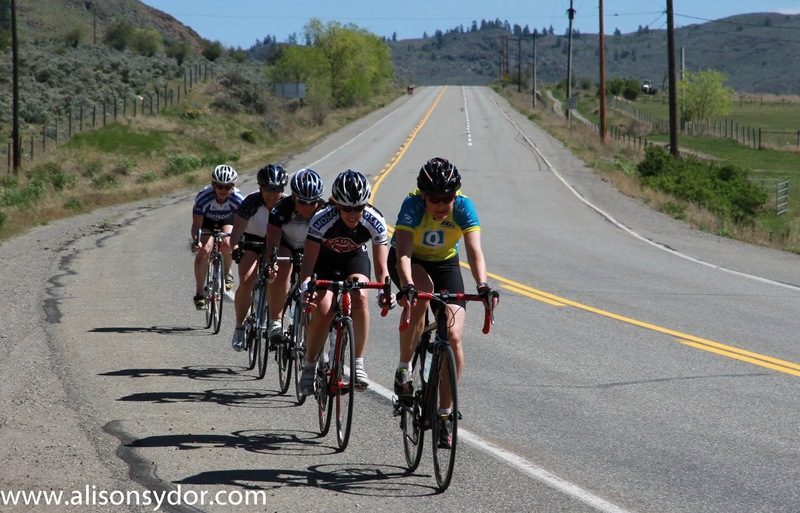 As it was our first day together we took the time to discuss the etiquette of group riding and practice our single and double paceline formations. 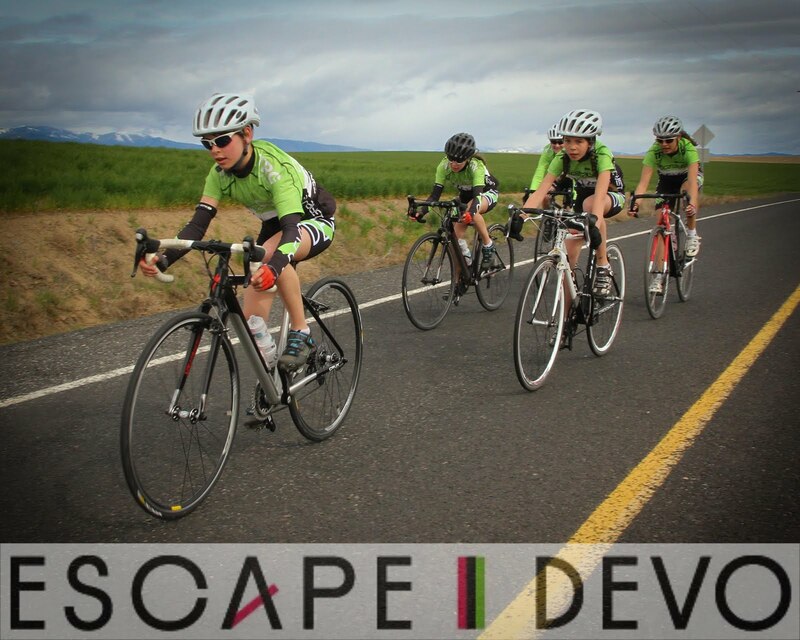 Once everyone is on the same page it makes riding in a group so much faster, safer and a lot more fun for everyone. After our first ride together it was time to enjoy a dip in the lake for our legs aka “the ice bath” - a new experience for most at the camp! It’s just the first minute that can be a bit rough, then it actually feels quite good. Somehow everyone quickly found a way to turn the ice bath into yet another social activity. I don’t know if I’ve ever seen any group get quite as much mileage out of their time standing in the cold water as this one did. After a warm shower, the Spicy squash soup and sandwiches went down easily. 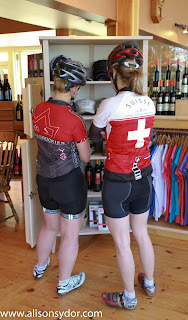 For the afternoon some chose to head out for some wine shopping while others curled up with a book or enjoyed a nap. We rejoined together for dinner and some great conversation before an en masse retirement for an early night. 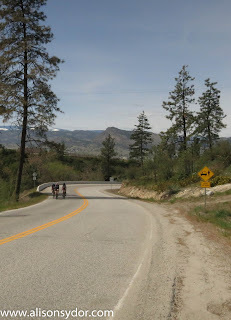 Fridays ride is one of my area favorites - up Green Mountain Road, the fabulous descent the other side, across the highway and into the hills of White Lake Road for a 94 km loop. Going up the long climb everyone naturally broke into smaller groups and we all regrouped at the top where my sister Jody was waiting by her car to greet us with liquids to re-fill our bottles and food to re-fill our pockets. It was really a great pleasure for myself and all the other women at the camp to have my sister able to join us at this year’s camp as the Camp “Slave Chicken”. 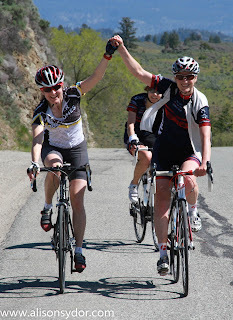 This is a term my sister and I coined for the one woman show support crew catchall position when she came to support me and my teammate at the 2009 Cape Epic in South Africa. I have to take the moment to say a big thank you Jody for giving her time to join us and support us so well during this year’s camp! From Green Mountain road we made our way eventually to Green Lake road and a quick stop at See Ya Later Ranch. 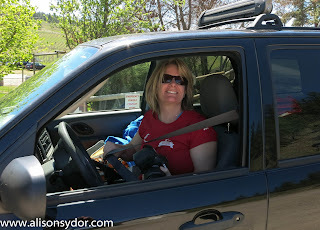 When in the Okanagan, gotta enjoy a few of the wineries too! By now everyone seemed pretty much right into the regular schedule. 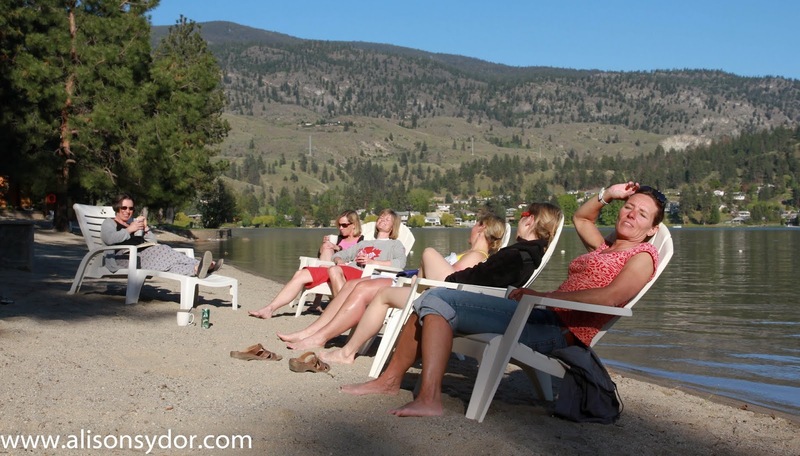 Ride-lake dip-lunch-relax. We joined together an hour before dinner for a nutrition lecture by Kelly Ann - who is one of the dietitians on contract with the Calgary Sports Center. 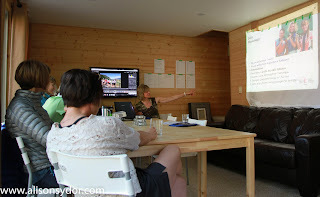 Kelly Ann was working also with the Canadian Olympic Team in London and will do so again in Socchi. As a bonus Kelly Ann’s presentation included quite a history lesson with her slides and images from our many years racing on the national team leading all the way to more modern times in her role as dietitian for Team Canada from both the London Olympics and Pan Am Games. Before the camp one of the women had requested that we do a 160 km ride. This would be far longer than any of the rides I’ve ever planned for any Woman’s camp in the past. It was no problem to make a route with a few distance options, especially since we had a Slavechickenmobile - aka follow car - for the day. In order to do the ride logistics planning the night before I asked everyone to commit to their ride distance so we could have the right vehicles organized. To my surprise all except for one (with a sore knee) said they planned to do the full distance! 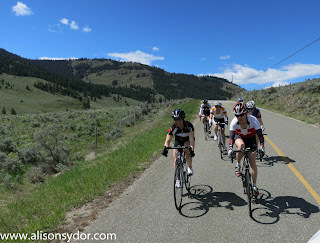 So on Saturday at 8 am sharp, under sunny skies with barely a puff of wind in the air we rolled out all together from Ponderosa Point for our longest day in the saddle. By now everyone was pretty comfortable - and might I add very capable of - riding in a group and so we had our top average speed of the camp for the 53k out to the base of Richter Pass. Feeling like a proud Camp Mom I was quoting our ride stats to everyone during our rendezvous with Slave Chicken at the Ossoyoos Tourist office. After a smoothly paced march up Richter Pass and the ensuing fast descent, we turned off the 3A towards the tiny border crossing at Nighthawk. 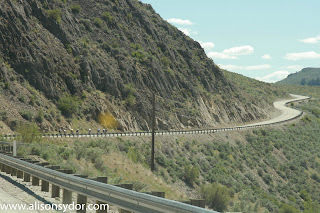 We had a bit more time there to refuel and rehydrate than planned due to one of the riders with a British passport having a minor visa issue. Anyway that was quickly sorted out with 15 minutes in the office and handing over 6 USD. Being the ever efficient Slave Chicken, my sister had in her purse a US 10, 20 and six one dollar bills. Kinda freaky and amazing how she knew to have that exact amount with her! Through the US border and onto the Orville road we had almost 40 car free kms along the windy river road for our enjoyment. 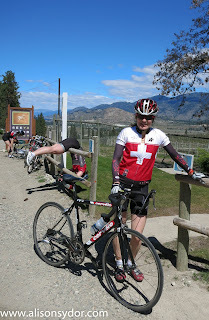 Once back across the Canadian border, 110 km into our ride, it was planned that one of the riders (sore knee) would call it a day and catch a lift home. 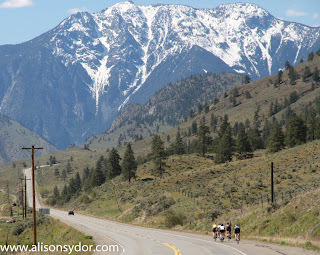 This was the final chance for us to fill up with food and water for the last 50km home, and for anyone who wanted to get a lift home to speak up or saddle up for the home stretch. Everyone was quickly back on their bikes and away. The final 50k was pretty flat and straightforward, though after such a long day riding fatigue was definitely creeping into the equation. 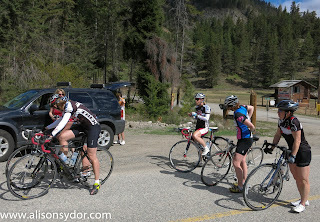 Keeping the food and liquids flowing, everyone managed their energies well for the entire six and a half hour ride. I was very impressed! 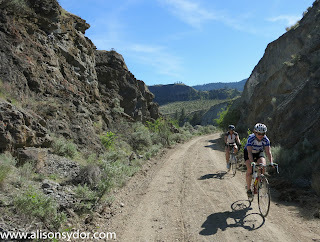 At Okanagan Falls the group split with half riding up and over the hill home on pavement and the other half taking the shorter, flatter but loose and sandy path home on the Kettle Valley rail trail. After such an epic day out on the bikes, the afternoon and evening to relax together was a time to thoroughly enjoy. 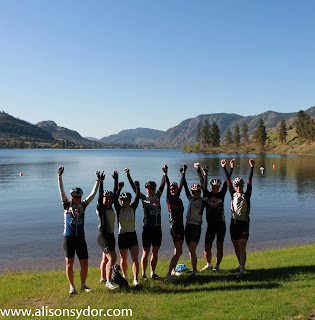 The weather gods had been smiling on us for the entire trip, and it was as satisfying to me to see a new group of friends hanging out lakeside on beach chairs in the afternoon as it was to see all the group rolling down the black sage road that morning in a perfect double paceline. 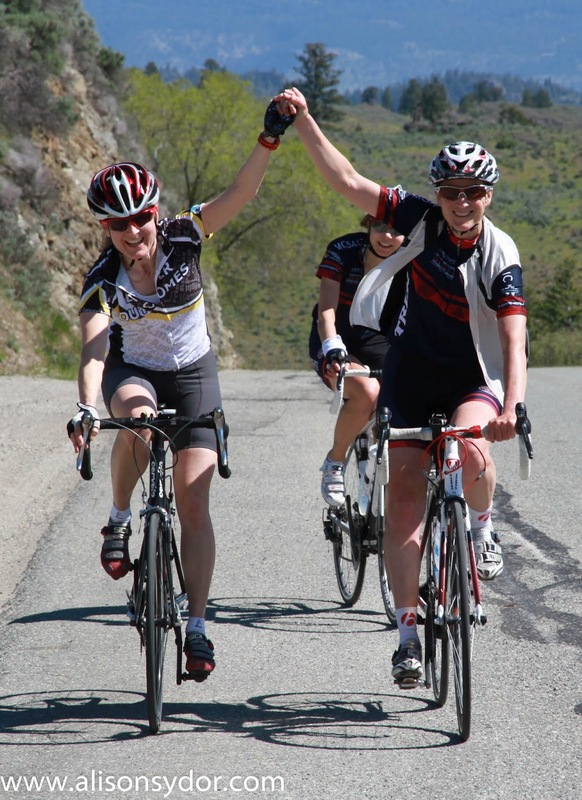 Friendships like physical fitness make us feel good and can give us pleasure, balance and perspective in our lives. But take a few weeks off the bike and you are back to zero, good fitness is (sadly) an easily lost thing. Thankfully good friendships on the other hand are not. Some of my best friendships have come through my involvement with sport. 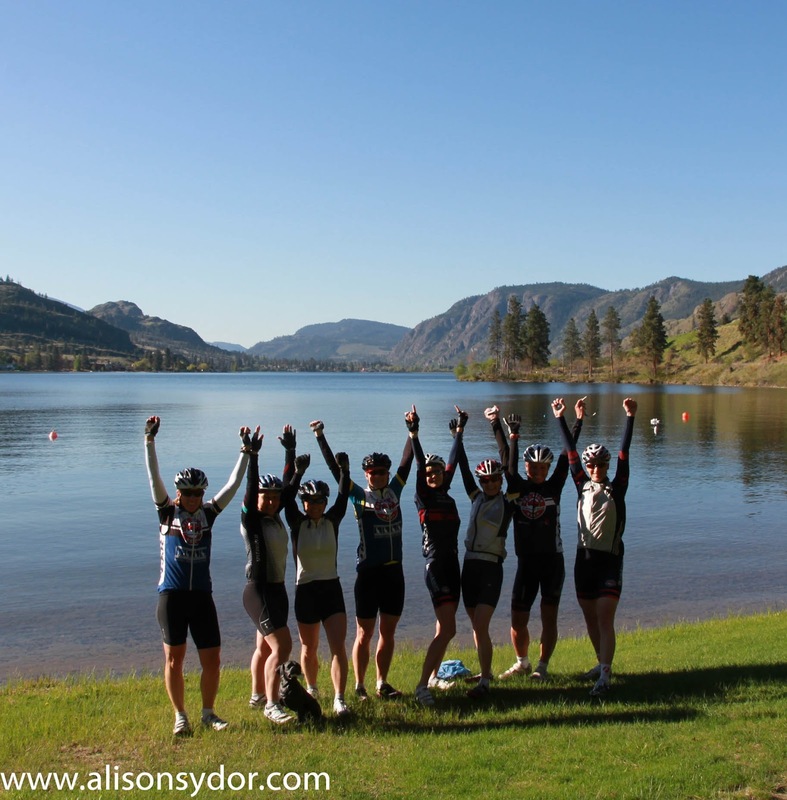 Sharing many hours in the saddle with the common struggles and experiences – along with sore butts, sore legs, exhaustion etc makes for some good bonding material. It’s part of why we want kids to play sports - in order to grow and gain for themselves from such strong connections and experiences. As can we all at any stages of our lives. So while fitness can be fleeting, I very much appreciate that many of the friendships I’ve gained through sport have not been so ephemeral in nature. During this camp one of the ever present themes is the bond and connection I have shared with former teammates (some who are at the camp as coaches – and others who the group comes to know through seeing pictures or hearing our stories), and how despite not seeing each other very often, we so easily rekindle those special relationships whenever the chance arises. I have enjoyed every year that I have hosted this camp for the riding and the opportunity to share my knowledge and help others to improve on their own riding experience. And without a doubt myself and the other coaches also appreciate this chance to get together, add to our memories and shared experiences, and each year bring a few more new friends into the fold! Finally, I want to express my many thanks to all the coaches for your generous sharing of your time and knowledge, and many thanks to our women of camp 2013 for spending your valuable time and energy with us. It was a pleasure to get to know you.... and to enjoy four great days all together doing something positive for our bodies and spirits.